Pure Land Buddhism is a somewhat unique school of Buddhism that was popularized in China, where it was transmitted to Japan. Today, it is one of the more popular forms of Buddhism. Developed out of the Mahayana Buddhist tradition, Pure Land sees as its goal not liberation into Nirvana, but a rebirth into an interim "Pure Land" from which Nirvana is but a short step away. Early Westerners who encountered Pure Land Buddhism found similarities to the Christian idea of delivery into heaven, though in reality, the Pure Land (often called Sukhavati) is much different. 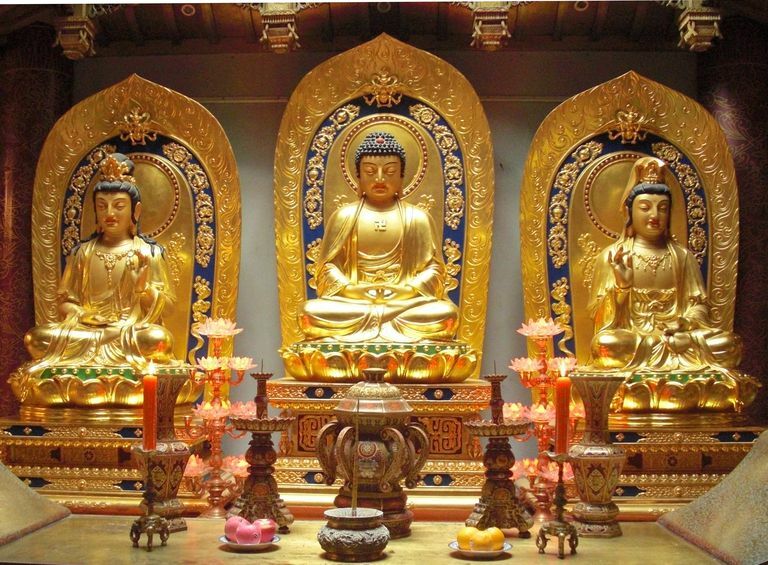 Pure Land Buddhism focuses on the veneration of Amitābha Buddha, a celestial buddha representing pure perception and a deep awareness of emptiness--a belief which shows the connection of Pure Land to traditional Mahayana Buddhism. Through devotion to Amitābha, followers hope to be reborn in his pure land, a final stopping point with enlightenment itself the next step. In modern practice in some schools of Mahayana, it is thought that all celestial buddhas have their own pure lands, and that veneration and contemplation of any of them can lead to rebirth into that buddha's world on the way to enlightenment. In 402 CE, the monk and teacher Hui-yuan (336-416) gathered 123 followers in a monastery he had built on the slopes of Mount Lushan. This group, called the White Lotus Society, vowed before an image of Amitabha Buddha that they would be reborn in the Western Paradise. Pure Lands are understood in many ways. They might be a state of mind cultivated through practice, or they might be thought of as a real place. However, it is understood that within a Pure Land, the dharma is proclaimed everywhere, and enlightenment is easily realized. A Pure Land should not be confused with the Christian principle of a heaven, however. A Pure Land is not a final destination, but a location from which rebirth into Nirvana is thought to be an easy step. It is, however, possible to miss the opportunity and go on to other rebirths back into the lower realms of samsara. Pure Land Buddhists accept the basic Buddhist teachings of the Four Noble Truths and the Eightfold Path. The primary practice common to all schools of Pure Land is the recitation of the name of Amitabha Buddha. In Chinese, Amitabha is pronounced Am-mi-to; in Japanese, he is Amida; in Korean, he is Amita; in Vietnamese, he is A-di-da. In Tibetan mantras, he is Amideva. In Chinese, this chant is "Na-mu A-mi-to Fo" (Hail, Amida Buddha). The same chant in Japanese, called the Nembutsu, is "Namu Amida Butsu." Sincere and focused chanting becomes a kind of meditation that helps the Pure Land Buddhist visualize Amitabha Buddha. In the most advanced stage of practice, the follower contemplates Amitabha as not separate from his own being. This, too, shows the inheritance from Mahayana tantric Buddhism, where identification with the deity is central to the practice. Pure Land remains one of the most popular schools of Buddhism in China. In the West, most Buddhist temples serving an ethnic Chinese community is some variation of Pure Land. Wonhyo (617-686) introduced Pure Land to Korea, where it is called Jeongto. Pure Land is also widely practiced by Vietnamese Buddhists. After Honen's death, disputes over the proper doctrines and practices of Jodo Shu broke out among his followers, leading to several divergent factions. One faction was the Chinzei, headed by Honen's disciple, Shokobo Bencho (1162-1238), also called Shoko. Shoko also stressed many recitations of the Nembutsu but believed the Nembutsu did not have to be one's only practice. Shokobo is considered to be the Second Patriarch of Jodo Shu. Today, Pure Land--including Jodo Shinshu, Jodo Shu, and some smaller sects--is the most popular form of Buddhism in Japan, exceeding even Zen.